What is the Hardest Part of Living with Illness? Your Responses! 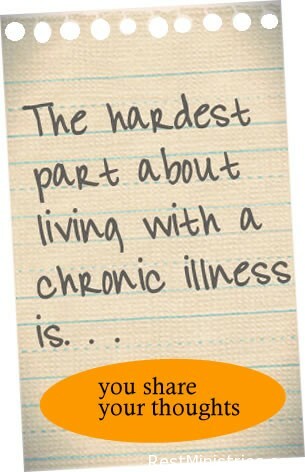 What is the hardest part of living with a chronic illness? Well, it depends on who you are asking, what time of day you are asking, and a million other factors. Yet, we all have so much in common and we can understand the challenges of the friend beside us even if we don’t deal with it ourselves. We all feel “called” to certain things, and not being able to do them–from homeschooling to making dinner–is difficult when we don’t feel we can do what we, and others, expect from our self. And the fact that it is invisible . . . well, that makes many of the struggles even more painful as we feel we must justify a housekeeper or a parking placard. We asked you, “What is the hardest part of living with illness?” and here are your responses. 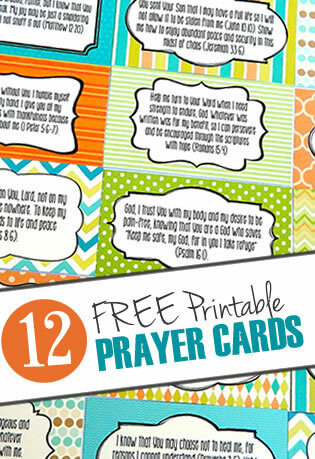 As you read through them, be sure to send up a prayer for our brave participants who shared their hearts. “Unrealistic expectations of me. My current family and extended family ‘angry’ that I can’t do the things I used to. ‘I want my Mother back,’ stated my daughter.” Bob and Mary Ellen, fibromyalgi, myofacial pain, arthritis, IBS, asthma, severe depression, anxiety, nerve pain from neuromas (feet), etc. “The hardest part of living with invisible illness is slowly watching the World go by, and see people leave your life. The L O N G sleepless nights filled with prayer and innermost moanings to a God you can’t feel right now. Your memories of able-bodied days Your knowledge that your loved ones are tired of dealing with your illness and knowing you’re a burden.” Jill, 3 spinal surgeries, diabetes, epilepsy, gastroparesis, degenerative disc disease, ostioparosis, nuropathies, etc. So, what can we do with all of the emotions? What do YOU do to get OVER those feelings of not getting everything on your list done, or frustrations of having to explain why your house isn’t clean? Remember Joshua 1:9: “Have I not commanded you? Be strong and courageous. Do not be terrified; do not be discouraged, for the Lord your God will be with you wherever you go.” How can we turn these emotions from discouragement and fear into strength and courage? 15 Responses to What is the Hardest Part of Living with Illness? Your Responses! I don’t have chronic illness but rather chronic pain from cancer treatment. I feel I can relate to much of this article and the posts here. Many people don’t understand how I feel day to day. They wonder why I don’t work full-time anymore. Often say, “It’ll get better”, or, “remember Rom 8:28? God is working good through this”, etc. . . when it would be so much more of a comfort to hear, “I’m sorry you live with chronic pain”. A good read…. thanks 🙂 Like most of you my illnesses are invisible too. Although spend time with me and you can hear I’m sick. I get the dirty looks & comments like “excuse you”. People have no clue. And I’ve decided to not say sorry or excuse me to anyone anymore as I could be saying it hundreds of times everyday. Thanks so much for this excellent post. I just found it this morning. It’s Sunday and I missed Church again, and went looking for some support. It’s so encouraging to read these many responses and find that so many expressed some of my very own feelings and thinking. Thank you to those who shared and help carry my burden. The most difficult thing… having the will to go on living. Valley fever has interfered with my life for four months now. It’s taken just as long to be diagnosed. Having M.S. and being tortured by chronic pain in my left leg (had a total left hip replacement in 2008; have not been ‘right’ since), this most recent diagnosis is bringing me precariously close to the edge. I try to stay positive, and ask for God’s help every day. Please, Lord, just let me get out of bed in the morning. Even though my roommate (husband, for lack of a better word) is helpful, he has the T.V. on anywhere from five to eight hours a day… I live with this noise every day, since he started working from home. UGH! It’s constant, annoying and frustrating! I have to leave the house just to get some peace and quiet. Your prayers are much appreciated, and am grateful I have a forum to ‘air my stuff’. Thank you. I know most of these comments were written a while back, but something that is really hitting me right now is chronic illness while being single. I see so many posts in different places where ladies can get through because of their great husbands or wonderfully supportive children or husbands with the support of their wives. I have neither (and never had). I was thinking of looking for an online support group for “sick and single”. Or starting one myself if I don’t find one. But I’m not sure if this is really a thought from God or just a pity party for myself. Any other single out there struggle with this? Would love to hear how you deal with the times when a spouse would really help, but there isn’t one. I can truly identify with the struggle of dealing with physical, emotional, financial losses-not having a husband or adult children to hold you, listen, comfort, give validation of how tough and lonely it is. family, friends etc don’t know intense pain, the extreme effort to keep up the house, the difficulty of having to ask for financial help for food, gasoline to go to another doctor appt., medication and many other situations that arise outside of what disability pays. just to find someone to help fix something on the house without paying a bunch of money-which don’t have. I could go on and on. having mental illness just adds to the mountain of pain. the desire to give up, to pray God would let you go home to heaven, are frequent thoughts. diane, be assured you are not alone, even though single. may the love and comfort of Jesus enfold His caring arms around you. The pain medicate makes me itch, I can’t take Tylenol pm to help me sleep my level functions are elevated. Menopause creeping up on me. Had breast cancer. I not sure if I am depressed or just pissed off? I know how you feel. Right now I know I’m invisible. It is I have been struck with lupus for over 30 some years. Along the way multiple hospital stays including14 surgeries. about 2-3 years ago I ended uo in that ugly wheelchair. I do a lot of arts and crafts and I decided to decorate my chair so it’s now fully decorated with rainbows and on the back says GOD BLESS AMERICA.. aS FAR AS the statement you look good and you feel like crud. I confess my answer sometimes I’m glad than you take the wheelchair and i’ll sit in that chair.. I know it’s not the best answer. I know it’s not the best answer but when it’s when I feel invisible. that’s when God says is that when God reminds me H is in control. People always asking what can I do to help. Take this pain away that’s what you can do. If not get out of my face. The hardest thing.., every time something comes up that we went to do we can’t because of me. The different doctors wanting to do these painful procedures, causes more pain or no relief……. I haven’t commented in awhile as I haven’t been diagnosed with the underlying cause(s) of my pain, tiredness, lack of balance, illnesses, etc. So I have felt ashamed because I don’t even know if I belong in this website. Plus, I have borderline personality disorder which, for me, is comprised of depression, anxiety, panic attacks, OCD and PTSD. More shame! Two years ago, after I got out of the hospital for a suicide attempt, I tried talking to people at my church about my mental illness but have been “pinged” (aka ‘persona non grata’) and “dissed” (aka looked at, spoken about or ignored in a ‘dismissive’ way so that I am invisible to most people in my church). When people do ask how I am, many times their insensitive responses make me cry and I have to forgive them AND ask God to forgive me for being angry/bitter and to rid me of those feelings. When I awake in the morning, I immediately say my Scripture affirmations as I do my stretches so I move properly and helps with my perspective. I was thrown out of a ‘Christian’ psychiatrist’s office, which my husband thinks is because the “Dr.” perceived me as a risk instead of a human being! When this “Dr.” started talking in circles, I challenged her quietly and with conviction in my voice. God did not abandon me then nor will He ever! Likewise, He does not abandon His people – whether they are whole in body mind or spirit – or not. We, all of us here, have to keep looking up to the best Source of comfort, peace, love and Antidote to pain, loneliness, grief, shame, abandonment, etc. Thanks be to God for His grace (God’s redemptioon at Christ’s expense) and mercy! I am African-American and the majority of black people don’t think that black people have mental illnesses. They just have to get it together basically. They also think that depression, anxiety disorder and PTSD means you’re crazy or insane. The other part is family and friends just don’t understand at all that I cannot work and they constantly give me things that I can do to work or go to school for money and I just can’t. I’ve been diagnosed with PTSD, major depression, panic and anxiety disorder, attention deficit disorder, and severe memory loss. I just wish someone understood that just because I’m not in physical pain or in a wheelchair, doesn’t mean that I am not disabled.